Learn about our cost-effective group dental plan offerings. CarePlus Dental Plans offers your clients the high-quality, comprehensive dental plan they’re looking for while simultaneously offering you stellar customer service and ease of administration. The average tenure of our existing CarePlus managed care groups is over 16 years! They trust our network dentists to provide clients the best dental care and at an affordable cost. Brokers keep recommending our plans to their clients because of the ease of administration for them and the ongoing support we provide on a daily basis. We’re proud brokers continue to trust CarePlus with their clients’ group dental insurance needs year after year. CarePlus Dental Plans’ groups are from a wide range of industries including automotive, education, municipality, health care, and more. Our groups range from two (2) members all the way to over 7,000 members. No group is too big or small to benefit from CarePlus group dental plans. We invite you to browse the links below to learn why CarePlus is the clear choice for your clients’ group dental insurance needs. Learn the benefits of a group dental plan with CarePlus. Read what makes us different. 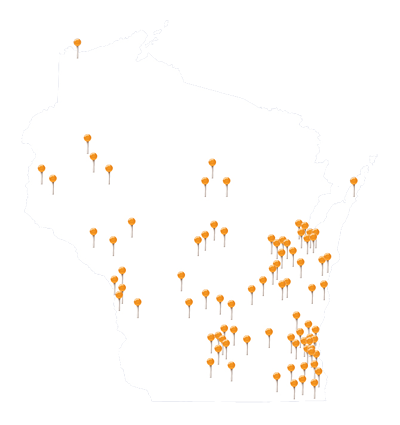 We’ve partnered with Midwest Dental to extend your client’s access throughout the state of Wisconsin.